Until fairly recently, I wasn’t a big animal person. It wasn’t that I disliked animals; I just didn’t have a major love for them. As a child I had the token pet fish and hamster, plus I did a bit of horse riding, until an allergy put a stop to that, but that’s where my pet experiences come to an end. Two years ago my Husband and I decided to expand our family in the shape of a gorgeous little brown Labrador called Jags. Meet Jags. Now, I’m bordering on dog obsessed. It’s amazing how one little furry friend can change your outlook so much. OK, I’ll get on with the point of my post! Our dog is very much a part of our lives, everything gets planned around him. I’m not one of those pet owners who think their animals are their children, but he’s the closest thing we have at the moment. The bottom line is he is very important to both of us. I often say to my husband, “I wish Jags had been in our lives so he was with us on our wedding day”. So today’s post is all about pets on your wedding day. Would you do it? Do you think it’s mad? 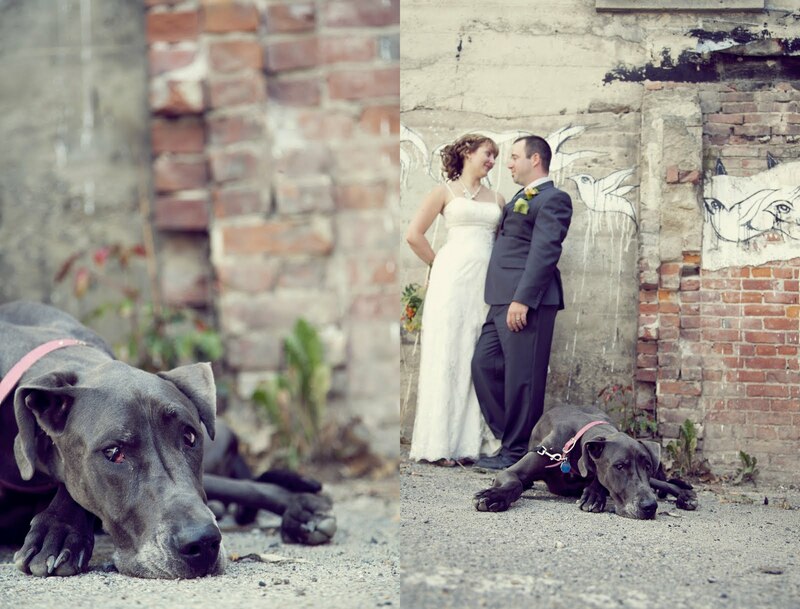 I love the family aspect of weddings and if you have a dog, you’ll know that they are family. How awesome would it be to have a wedding day like these? ♥ Check with your venue if pets are allowed. Be prepared for disappointment as not all venues will allow animals. Most pets will be dogs, cats and possibly birds; anything bigger and it’s likely to be a ‘no no’. If this option has been ruled out, perhaps pictures with your pooch as you’re getting ready would be nice. ♥ You need to think practically! Having your dog present for your entire wedding day isn’t very sensible, but they could be part of the ceremony or part of the photographs. ♥ Plan for all eventualities, in particular clothing, weather, toilet breaks and children. It wouldn’t be the best idea to have pictures with your dog if it’s pouring with rain and you’re in a muddy field. That white dress would soon turn brown. Have a plan B up your sleeve. ♥ Think about hiring a dog minder for the day. This will relieve you from the pressure of constantly watching your dog and give you the freedom to enjoy your day with them. I suggest you don’t ask friends or family to do this, after all it is your big day and you don’t want them preoccupied with your pooch. If all plans fail and it’s not possible to have your pet with you on your day, how about a pet friendly ‘trash the dress’ day. I’m planning to do this with my pooch. I get to wear my dress again, have a day out at the beach, bring the dog and have some gorgeous pictures of him. Any excuse to dress up again. Please do get in touch if you involved your pet at your wedding – we’d love to see it!